If you own a Solatube Daylighting Device you already know what a difference it can make to your home. That bathroom that you tried to make brighter for years with different pallets of paint colors is now brilliant with the natural light coming in. You are likely in the habit of trying to turn off the light when you leave that room! Did you know that you can add a few features to your existing unit? Bathrooms can get humid which wears on the walls, ceiling and windows. 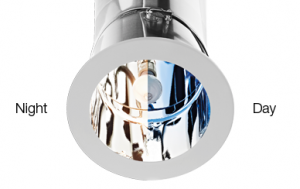 A Solatube Ventilation Kit could be a perfect solution for you. It combines daylighting and ventilation into one attractive fixture that controls humidity and freshens the air. The motor is mounted in the attic which allows the unit to run very quietly. Our installer’s run the duct work outside where it can properly exhaust. A Solatube Light Kit is a perfect solution for you if you need your Solatube to have a functional light in the evening. The design of this is quite simple and can be added on after the Solatube has already been installed. Our installers can tie it into an existing switch or add a new one. The light kit works with halogen, compact fluorescent and LED bulbs so it’s up to your personal choice. Maybe you have a Solatube in a space where you would like to darken the room for a nap, watching TV, or early morning light is not what you want waking you up. A Solatube Daylight Dimmer can easily be installed after a Solatube has been in place. This butterfly baffle system allows you to control how much light in coming in. It’s designed to fit in the tubing so no additional ceiling work is needed. This is ties to a wall switch and place on a dimmer to make it truly functional to suite your needs. If you have an existing Solatube Daylighting Device and would like to enhance it a bit or interested in adding a new Solatube to a room, we are just a phone call away at 847-201-6045.